Once upon a time, say this past July, a hungry, tired couple riding their motorcycle from Alberta to Wisconsin checked into a fabulous hotel in Billings. The restaurants in the hotel were closed. So they walked down the street and into the Montana Brewing Company. The place was hopping, full of white people being waited on by skinny young servers with perky blonde ponytails. They were seated, handed menus, and the woman asked the skinny ponytail assigned to their table if there was a gluten-free menu. Three years before, the woman had traded the chronic disease with which she was diagnosed in her early 20s for the one she actually had. Now she was one of “those people.” The ones who, when you invite them to dinner, tell you what you’ll be serving. She figured the gluten-free menu would look similar to the one in her hand. It was many pages long, large and heavy and laminated. Delicious options, such as “Wood-fired Nachos” and “Roasted Garlic & Brie,” were described in glorious detail. It was late. She was tired and hangry. She needed more than a salad, but didn’t want a big, heavy meal. 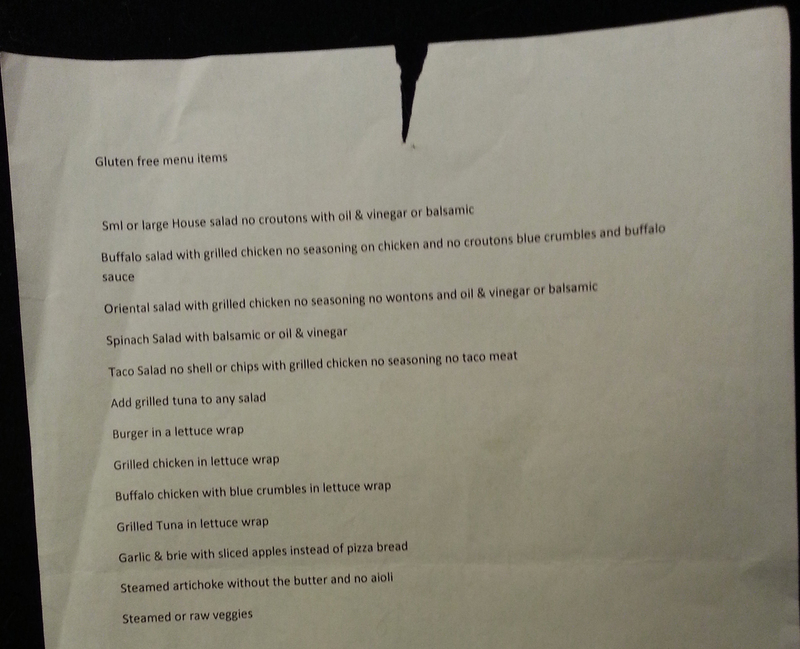 The server returned with her gluten-free menu. It told her everything she needed to know about what the Montana Brewing Company thought of her celiac ways. Her man ordered a beer and something yummy. She went for the only thing that bore any resemblance to the “You are our kind of people” menu – the roasted garlic & Brie – with apples instead of pizza bread. It was exactly what she was in the mood to eat. The server was back in no time flat to tell her that the kitchen was out of apples, so no brie and roasted garlic. She ordered steamed vegetables. Her sweetheart had a beer. She drank wine and served him a verbal appetizer of righteous indignation spiced with bemused laughter. Then dinner arrived. It turned out the kitchen was out of steam, too. She ate raw veggies and ranted. She watched Sweetheart enjoy (as much as anyone with a ranting dinner partner can) his perfect dinner. Before they left, she asked Ponytail if she could keep the gluten-free menu. They walked back to the fabulous hotel, fell into bed and slept. Then the sun came up, and the day was new. The hotel diner was open. The couple ate breakfast. She ordered eggs and potatoes, which came with gluten-free toast. He ordered Captain Crunch French Toast. They drank excellent coffee. It was heavenly. Their server had dark hair, a cool tattoo and a six-year-old son. By the time the couple rode out of town, the woman and the server were friends on Facebook.